[A very long break.. I regret that I left the story in the most important part.. The story is now going in its sad and melancholy mood.. It is now time for Tridev and Karmphal daata to stabilize their daughter’s life..
Kamala ran forward and hugged around and sat on its round base. She was able to see herself, sitting on the laps of Lord Shiva and hugging him. “Putri Kamalanayani” said Lord Shiva opening his eyes and time stopped. Her eyes were closed but her face could express the deep pain she was in.. Lord Shiva gently patted her shoulders and head.. “Kamale, it is ok.. Everything will be fine..” said Mahadev in his gentle voice.. “How will things get fine, Pithashree.. Why am I pushed into pains though I haven’t harmed anyone? I wanted those flowers for your pooja.. But, my wish with devotion yielded me an unforgettable curse.. If it was just for me, I would accept and fight back, but how can things get fine, when my Praaneshwar has also been cursed..” said Kamalanayani with innumerable questions in her heart. “A normal human might find it impossible to tackle, but the girl who sprung from the taposhakti of Tridev and Karmphal daata will not find it difficult..”, heard a voice. Kamala did not turn back to see who has come, but said “Karmphal daata Shani dev” wiping her tears. “You are still unaware of your capabilities and shakti, putri” said Shani dev standing behind Kamala. “But, I am aware of your capabilities.. I understand why people believe that, you are bring them pains.. I understand, why people are afraid of you and don’t stand in front of you… You are taking away their happiness.. Am I right Pithashree?”, asked Kamalanayani turning towards him. “The fact is not like that Kamala” Shani dev, tried to explain. “Is this the power of your Vakra-drishti.. Is this justice.. Is this Karmphal Pithashree.. I wanted to your direction towards the right path.. That’s what I believed your Vakra-drishti would lead me to when you cast it on me.. But, it has led my life to an inescapable dead end. I am doomed.. Everything is over..” said Kamala with grief..
“If everything is over, then why are we here..” heard two voices saying the same.. There appeared Mahavishnu and Brahmadev on the either sides of Kamalanayani. She was surrounded by her fathers on all four directions. She turned towards all of them and offered her obeisance. “When your heart and soul is filled with pure intentions then, even a curse could become a boon..” advised Lord Narayan. “I don’t understand how you all can be so cool when your daughter’s life is turned upside down” questioned Kamala. “For a coin to be accepted, both of its sides should be present..” reasoned Shani dev. Kamalanayani began to understand..
“We know that, it invokes pain inside you, but not all stones get venerated as the divine; Only the ones that accept the pain given by the sculptor, becomes the statue of divinity. It gets daily abhishek-aradhana (obeisance of holy bath & pooja). You are for a big motive, so you have to accept these things.” advised Brahmadev. Kamalanayani nodded with deep thoughts. “Still we offer you an option to choose over your decision.. you can either stay back and fight your problems; else, you can quit them all..” said Lord Narayan with smile disappearing from his blissful face. “Our daughter cannot be the one who runs away from situations.. She is the one who stands, faces and conquers her problems… We believe so..”, completed Mahadev holding Trishul in his hand and hope in his face. Kamalanayani, wiped off the tears from her face expressing that, she understands her fathers..
“Thank you Pithashree.. you all have stabilized me in time of my need.. Thank you so much..”, she bowed offering obeisance and due respect to her fathers, holding her hands together. “So, what is your decision, Putri..” questioned Shani dev..
“I, Madava-Mahadeva-Brahmadeva-Shanaischara Putri Kamalanayani, whose name’s every letter is named after her Pithashrees, will never disappoint them.. I will stay back and face all the problems and trash them into nothing and will bring happiness to my fathers..” said Kamalanayani with confidence. “This is all we wanted..” said Brahmadev. Again Kamala, bowed towards them. “Vijayi Bhava Putri..” blessed them four and disappeared..
Everyone, looked at their Rajkumari Kamalanayani, who was standing alone in the place where the Shiva linga emerged. Someone, touched her shoulders from behind and she turned in little shock.. “God doesn’t appear in front of every individual.. God is like the air, present with us, we can feel, but can not see..” explained Rajkumar Pradyumna. “Yes Jyest.. I agree with you.. He is omnipresent, Omnipotent and without whom, we cannot live.. Just as air, he is with us..”, Kamalanayani said with a small smile on her cheeks. “Are you fine dear..” asked Rajkumar Abhimanyu. “I am absolutely ready to face the next events.. I am fine, due to the divine grace..” replied Kamala. “We should get back to the palace.. And guys, remember, if someone ask about our visit to the temple, then we should reply that, Kamalanayani had a little headache, so we returned immediately” lectured Rajkumar Pradyumna. “That is fine, but we can never hide anything from Mamashri..” doubted Rajkumar Abhimanyu. “You are right Swami.. I will explicate everything to Pithashree in person..” said Kamalanayani. They all returned to the Mathura Palace. When their Dadimaa Devaki asked, they replied as instructed by the crown prince of Dwaraka. That night.. Lord Krishna visited the room of his daughters. Kamala was sitting on the window wall looking at the moon. Padma who was examining the gift of their grandparents, greeted him when she noticed his presence. Still Kamala was deeply immersed in thoughts. 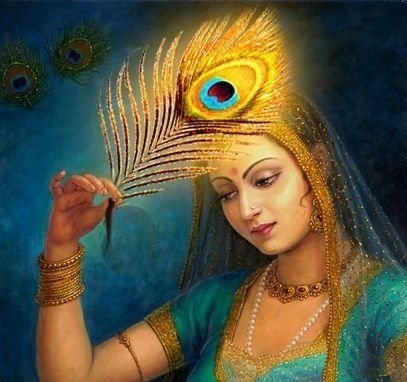 Lord Krishna approached near her, yet no difference. “I guess you are finding some solution from the crescent moon” said Lord Krishna. Kamala turned in shock, towards her Pithashree. Immediately she bowed and was sorry for not noticing his presence. He comforted her with a gently hug. “What was Chandradev saying..” asked Lord Krishna in his own way. “Nothing.. but deep silence Pithashree..” replied Kamalanayani. Precap: Lord Krishna advises Kamalanayani with words of deep meaning. They return to Dwaraka. Kamalanayani’s friend Chandrika’s wedding is planned by her parents. The groom’s family attempts to humiliate her, as she stays in the palace and no one monitors her presence. What will infuriated Kamala do? This story’s next part will be released soon. Stay tuned.